Eleven o’clock. The heat increasing with every passing minute. I can hardly bear to think of time. There should be another five hours of road before us, but now? God only knows. A stunned-looking Archaeo-man pulls out his cellphone. I scrabble in the glove compartment for a number to ring. In vain. But, as luck, or diligence, would have it, we insisted they write a letter detailing the vehicle’s insurance – in the absence of a certificate. It’s on headed paper. With phone numbers. Index finger shaking visibly, Archaeo-man pushes at the keys of his basic cellphone and puts it to his ear. I’m shaking inside, not moving, concentrating on holding myself together. Someone, somewhere, will help. Surely, someone will help. I run through the obvious options in my head. We both leave the vehicle, hitch a lift back to Nyimba. No. The electric windows have stuck open – and we’d have to leave all our luggage behind. I hitch a lift back to Nyimba, leaving Archaeo-man. Archaeo-man hitches… no, definitely not on. I find the receipt from the petrol station, just as a shocked-looking Archaeo-man tells me there’s no help on the way. No vehicle available. 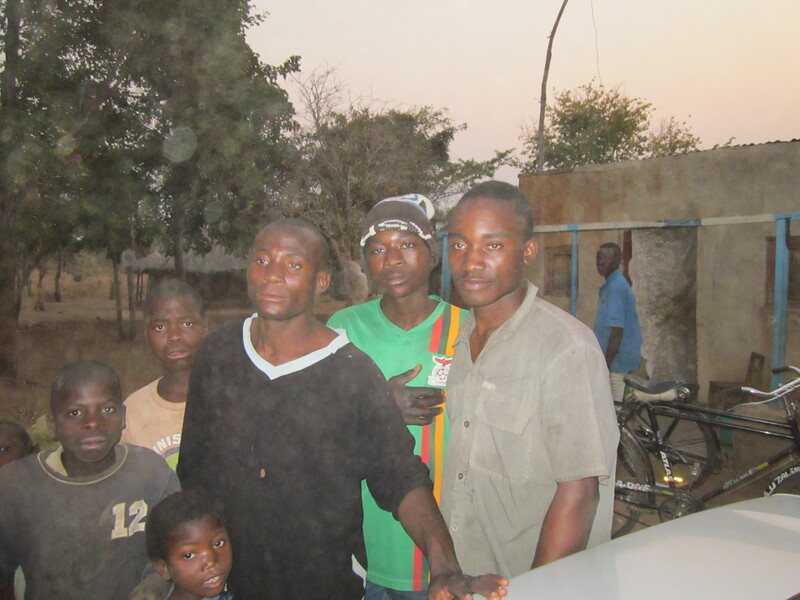 Possibly a mechanic in a taxi from Lusaka if they can get hold of him – and if we’re willing to pay. I thrust the paper in front of him and he rings the local garage. The person at the other end hangs up as soon as he speaks. Twice. By this time a young woman with a baby has arrived. I fight to hold back the tears. Another woman arrives and yells, in the voice of a sergeant major, for Johnny. Johnny crawls under the car, takes a look at the wheel, emerging shaking his head. Fruitless phone call after fruitless phone call. Shock waves from every too-close-passing lorry terrifying us with their power. 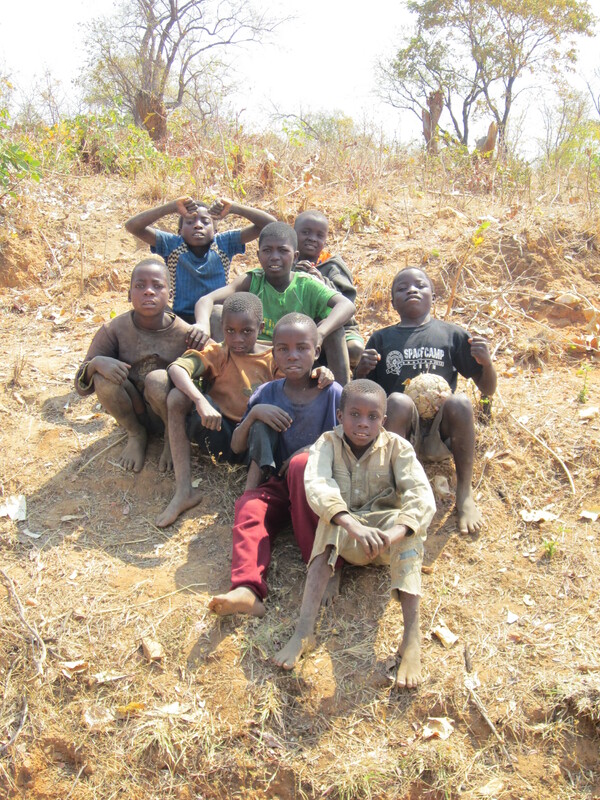 No-one seems in a hurry to help us except the only people who can’t – little boys in rags. With bad coughs and fascinated eyes. Nineteen of them sitting on the bank beside us now. We ring the owner of the place we were staying in desperation. He, too, is on the road. But he organises a driver to fetch us. Five hours – at least. But a promise from someone we trust. I try not to think of when he might arrive – an hour, or two, after sunset? Time passes. Slowly as an ox-cart by the main road. Each minute an hour. We sit, baking, in our tin can. Reluctant to drink too much from our stock of bottled water while nineteen small boys with not a drop between them scrutinise our every move. And of course, how on earth can I pee with no trees, no shrubs – and an audience? There are gasps and giggles when I stroke Archaeo-man’s shoulder in reassurance as he waits – and waits – for his cellphone to ring. ‘Do you eat pap?’ asks the kind young woman with Winnfreda – one year nine months – on her back. I thank her. We have food. I give her lemon cream biscuits that we bought for the guards on the road blocks. She smiles as she heads home for lunch. The most comforting thing that has happened in the last – is it only three? – hours. We will be here some time, we know that now. One more call to the car hire firm, worrying now about our talk time – our lifeline – running out. A local mechanic has, we’re told, driven 20 km from Nyimba three times and not found us. The locals say we are 15 km from the town. The car hire firm says they are wrong. ‘They are lying,’ says kind young woman, now with son, age 9, Ignatius. Three o’clock and all optimism has faded from our shaken spirits. The sun has moved through the sky and we adjourn to the shadier back of the vehicle, legs stretched across, facing each other, though not looking – in case we catch each other’s eyes and crumble. The boyish fan club has diminished. One child in a green t-shirt has stayed – and now he ventures nearer. Speaks to us. In a language we can’t understand. I find the strength to smile. He beams back, not frightened of being close to us, unlike the others. He runs his finger around the trim of the back, big eyes taking in every detail. Rubs the flashing hazard light. Two others join him. They do the circuit of the vehicle, touching everything. Muttering. Green t-shirted boy saying things, the others responding, ‘ehhhhh!’. He reaches us again. Stands by Archaeo-man’s foot and traces the shape of his canvas shoe, the laces, the rubber sole. Watching him brings me down to earth – a little. But then I look at my watch. We’ve been stewing in this unkind heat for five hours now. Two men with beery Saturday-afternoon-breath approach – and we brace ourselves. He’s a farmer. He’s angry – at politicians. His explanation of the rural farmer’s plight engages Archaeo-man, I can see. I’m skimming the surface, nodding, but mostly worrying. Do we have magazines? We hand over The Economist and New Scientist – all we have. No football, no fanzines. Silence falls as they are passed around and scrutinised. Five o’clock. And the situation’s becoming more serious. The driver is at least two hours away and the sun will be setting soon. We’re not far enough off the road. And our red warning triangles keep blowing over in the powerful aftershock of each passing bus and lorry. That’s when a young man drives up in his silver car. He parks in front of us. Clothed in the cleanest t-shirt I’ve seen since Lusaka – cleaner by far than us – and jeans, he drops to the ground and wiggles beneath the front wheel. Tears come to my eyes. Green t-shirted boy looks horrified and moves away to the bank where he keeps a wary eye on me, his young brother by his side. Men appear to help. They run for boulders to help raise the vehicle and stop it from moving. Break branches to lay in the road. Wave angrily at vehicles passing too close. One last call to the hire firm produces a text with the phone number of a contact in – wait for this – Nyimba. Yes. A contact. In Nyimba. Less than half an hour’s drive away. It’s so we can leave the vehicle there. I’m too stunned to say anything. An inadequate bolt is found. Green t-shirted boy fetches a home-made metal hammer to bash the wheel rim back into an acceptable position. The wrong bolt and ill-fitting nut are just about holding the wheel on the car. It’s fragile, but it moves. The car hire firm’s insistence that we should not leave their unreliable vehicle unattended, despite our own peril, has settled in Archaeo-man’s brain. ‘We’ll drive it to Nyimba and leave it there,’ he says. I see the young man saying no with his eyes. And I understand them both. I insist we drive to the young man’s house and accept his offer of a lift. ‘What’s your name, I ask, relief loosening my manners. He writes in the sandy ground with a stick. ‘I write it because I don’t know what it means,’ he responds. I wave my arms around towards the sky. 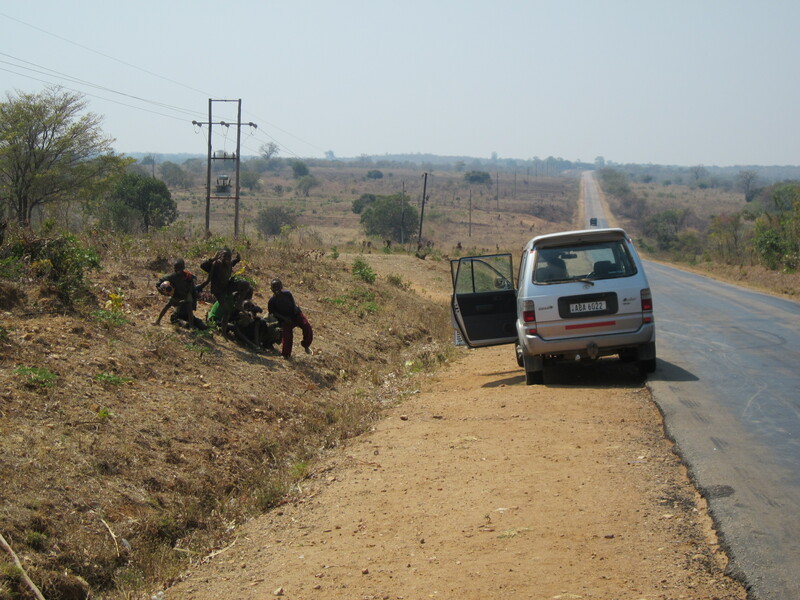 This entry was posted in If you only read one ..., Zambia and tagged breakdown, car hire, cellphone, driving, Great East Road, Nyimba, road, Travel, Zambia. Bookmark the permalink. 5 Responses to On the road to nowhere . Part 2. I guess this happened a while back? It sounds harrowing! Oh no, it’s all too recent – and we’re still recovering. It was a very frightening experience. I wonder if without the cellphones we’d actually have reached a solution sooner – but I’m trying not ot think about it now, one more post to wrap it up. We’re back home now, safe sound and just rather tired! Basically – whew! Also, goodness in unexpected places. Cosmos was wonderful and I dread to think what would have happened if… but never mind, home now, tired but with yet another set of Afri-experiences! Cosmos is not only the sky, stars and everything (shades of Fotherington Thomas) but also a flowering plant that in places colourfully adorns long roadsides in vast South African spaces.